Retiring New England farmers have identified a need for help to navigate the complex process of choosing the right farm business succession strategy and finding a suitable successor. Many also want technical assistance on specific aspects of farm succession and transfer. Exiting farmers need attorneys and other service providers who specialize in farm succession. 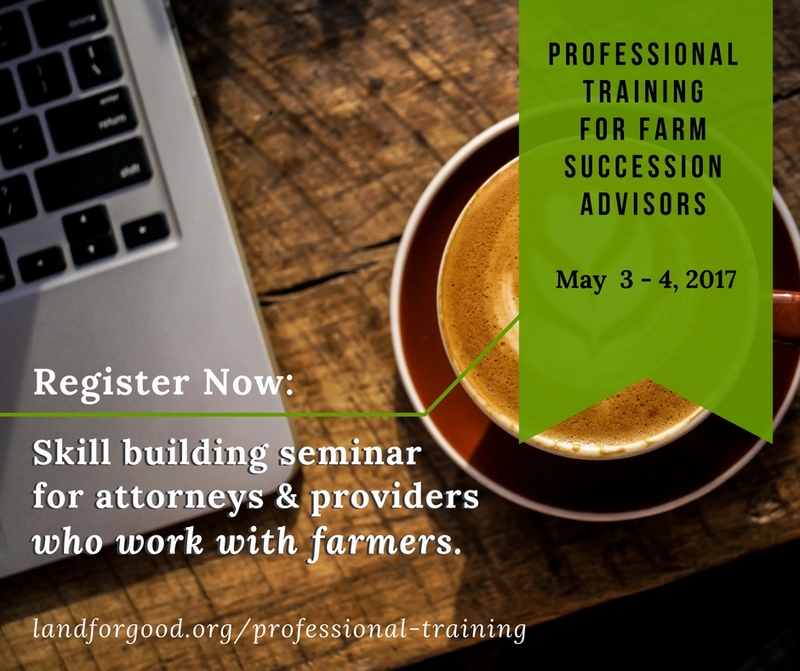 Land For Good is hosting a two-day Farm Succession Advisors Training on May 3 – 4, 2017 at the Falls Center, Manchester, NH to build this professional support. The training will build skills and proficiency in assisting farm families through farm succession and transfer planning. It will also allow professionals to connect with other farm service providers in their state to deliver quality succession planning and assistance to farmers. Delivered by legal and other experts, this accredited course is approved for 12.5 CLE credits in Vermont and Maine. Self-certification is available in New Hampshire, Massachusetts, Connecticut, and Rhode Island. Professionals working with farmers, including experienced and new attorneys, law students, field staff, accountants, financial planners, land trust and conservation staff, and lenders are encouraged to attend. The event is supported by a grant from the USDA National Institute of Food and Agriculture through its Beginning Farmer and Rancher Development Program and delivered as part of the Land Access Project. Land For Good, and its host of collaborative partners on the project, aims to equip farm succession advisors with the proper skills they need. The project takes a comprehensive, systems approach to improve programs and policies around land access and transfer in each New England state by working with established and transitioning farmers, landowners, conservation organizations, service providers, communities and policymakers. Farm transfer is a critical issue for thousands of farm families in New England and nationally. At no point is a farm’s future more at risk than during this transition. For more information or to register for this training, go to landforgood.org/professional-training or call Land For Good at 603-357-1600. Land For Good has helped hundreds of farmers and farm families find innovative solutions that keep their farms in farming and provide a meaningful legacy. Founded and based in Keene, Land For Good works throughout New England to help farmers access and transfer farms and farmland.